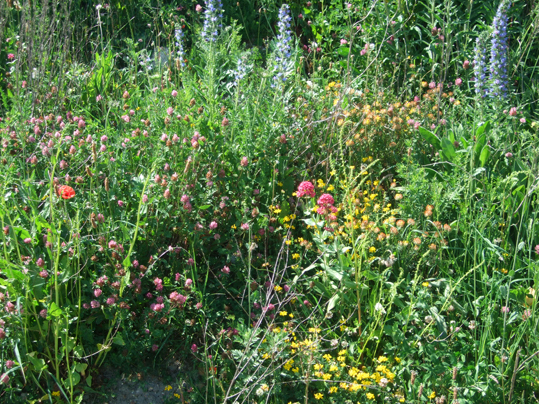 I saw this profusion of wildflowers growing on a building site. Not only was it a lovely surprise to see beauty in an unpromising place, it also reminded me that good things can happen even when you expect things to be bad. The building site in question is on Martello Field, at Sovereign Harbour in Sussex. I was part of a campaign to save this piece of land next to the sea from development. The campaign failed and the houses being built there are nearly finished. Yes, I feel sad that people can no longer stroll there and enjoy the view. However, I couldn't help but feel joy when I saw amazing display of wildflowers on a bank of rubble and soil the builders had deposited. As they say, it is an ill wind that brings no one any good. Back in 2016, when the plans to build homes on Martello Field were being discussed, I cast a circle and asked the goddess of the place to save the land. As I blogged back then, I got a clear response in my head posing the questions: "How do you know what I want? You love the land as it is, but maybe I want to give homes to people to live there. How do you know what is best?" I realised it was true. I tried to explain why I loved Martello Field - including beautiful pagan rituals I had taken part in there, beside the sea - but I realised that my desire to preserve the land in its current state was largely selfish. I have the luxury of a place to live and holidays by the coast while others are homeless. To me now, these wildflowers give another message from the goddess. Nature can find a place around the homes people need to live in. There can still be beauty in urban places. We just need to look for it.